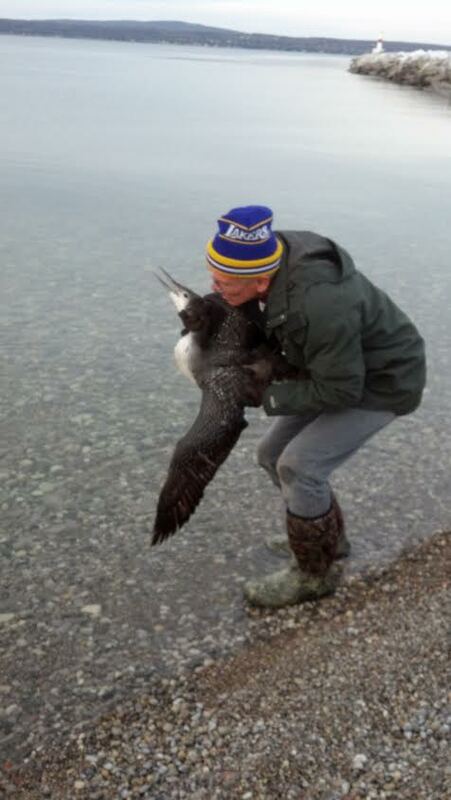 2014 began with a stranded loon rescued on Round lake, and it seems to be finishing with one. 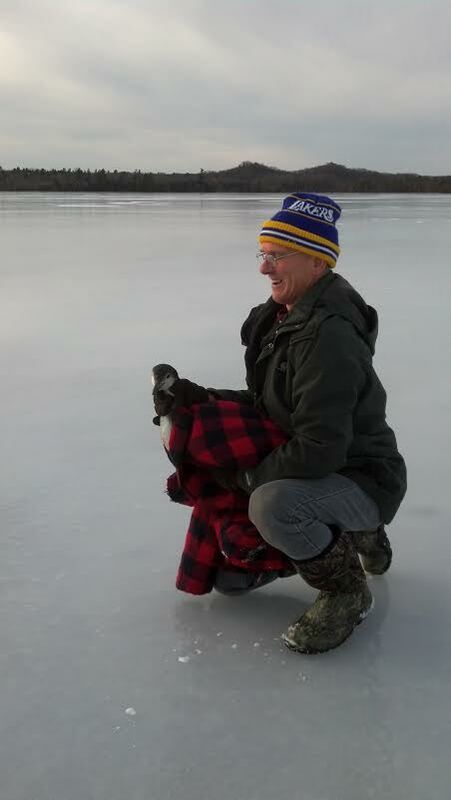 Days after I reposted the story from our New Year’s day rescue, Dean Sheldon called to say a loon was down on Round Lake. Preparing for what might be a tricky and dangerous rescue, I was relieved to hear he’d seen two skaters across the lake. Slippery ice, but little chance of falling through. 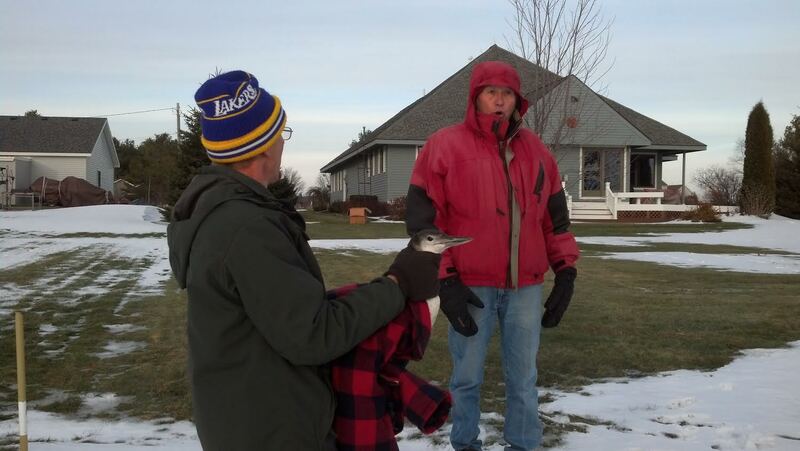 Well, the skaters turned out to be Ron and Lori Pool, whom I’d called immediately for help in capturing the stranded loon. Ron and Lori had been present on many capturing and banding excursions before, and within the hour, had formed the other two corners of a slowly closing triangle, in which we hoped to trap the loon for capture. Sitting hunched over, and looking ever ready to bolt and lead us on a merry, but exhausting chase, ending with bruised bodies from countless falls on the slick ice, I came at the loon head on, with Ron and Lori approaching unawares. Luckily, this intrepid loon chose to stand and fight, lunging out at me before I got to within arm’s length and clamping onto my gloved hand and not letting go. This allowed Ron to slip his plaid jacked over its unguarded body and carefully wrap the bird up, which it strangely regarded of lesser importance than showing me who’s boss by continuing to stab at me with its swift bill, in the far from weakened state I had expected, being at least a day out of water, and several meals behind. With farewells and thanks to Dean and Florence for their keen spotting of the wayward bird, and a scolding to all by me for failing to put the “Closed For Winter” sign out for the season, we transported the loon, feistily snapping from inside his partly closed cardboard box in Ron’s truck, to our now default release site at the Petoskey waterfront. 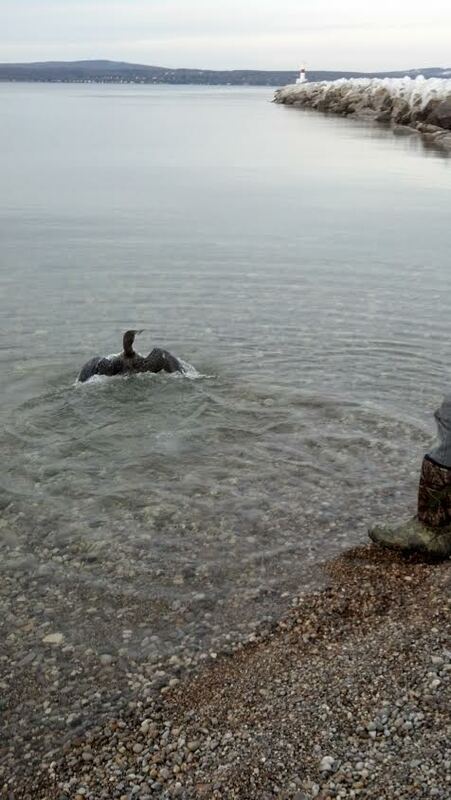 Susan, Lori, and I watched, and filmed, Ron release the loon, a partly molted adult (indicated by the still-spotted wing coverts), onto the tranquil water, just to left of the breakwall. Expecting a grateful, fast escape into the lake, the loon, determined to make a final stand, instead ignored the freedom of the open water, turned, and surprised us all by having a last go at Ron, jump/flapping several times, and stabbing out with his lightning, sharp bill. Seeming content with this face-saving show of strength, the loon finally turned to the waiting open water and swam off, diving repeatedly and eventually settling down to a long-overdue preening session. 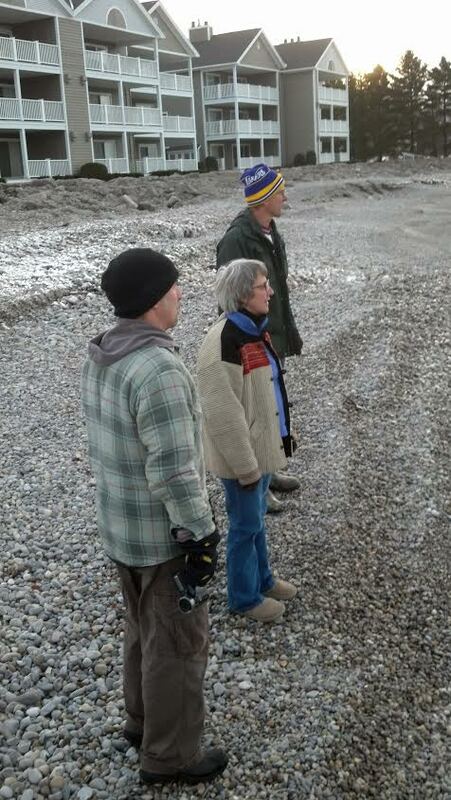 As I tell our many supporters, loon work doesn’t end when loons leave their nesting lake for the season. LoonCorps is always on call, and ready to act in emergencies such as these. 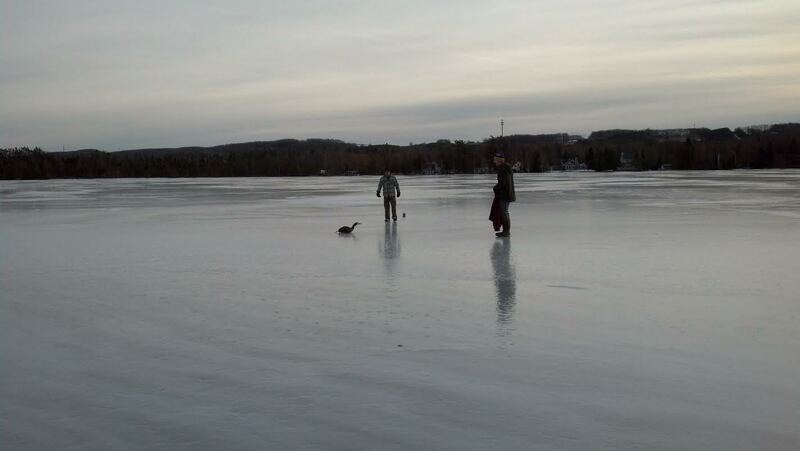 This loon was doomed the moment he dropped down and slid to a stop on Round Lake’s frozen surface. Reaching open water, without the help of people, was an impossibility, and I am grateful for Dean, Florence, Ron, Lori, and Susan for their keen eyes and helpful hands during this critical rescue. Thanks much to Lori Pool for taking all these pictures, with the exception of the one at bottom, which I slipped in here from last year’s rescue, lest she think she’d escape being pictured here. 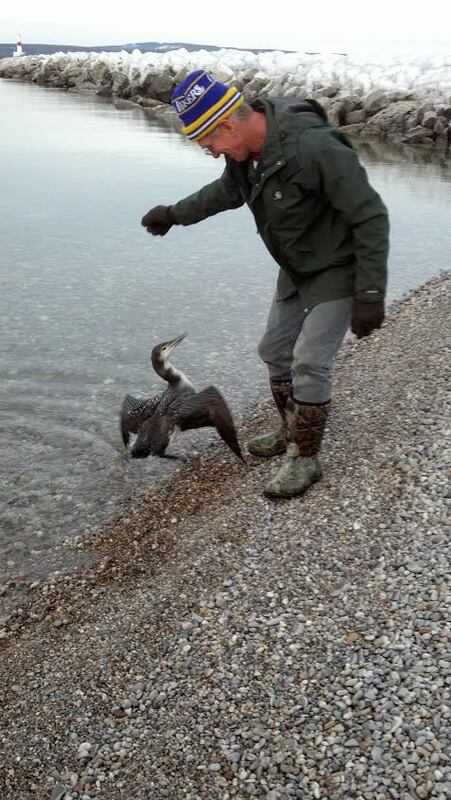 Posted by Jeff Lange on December 9, 2014 in Loon Rescues and tagged Common Loon, Dean Sheldon, Jeff Lange, Loon Rescue, Looncorps, Lori Pool, Petoskey, Ron Pool, Round Lake, Susan Lange. Hopefully only temporary, Sharon. We’ve learned funding assistance has been offered (and accepted), so that’s one excuse the State can no longer make for inaction. What a great story! I guess you can excuse the loon’s apparent ingratitude—he was having a bad day. He was guarding against the worst scenario. Smart loon.